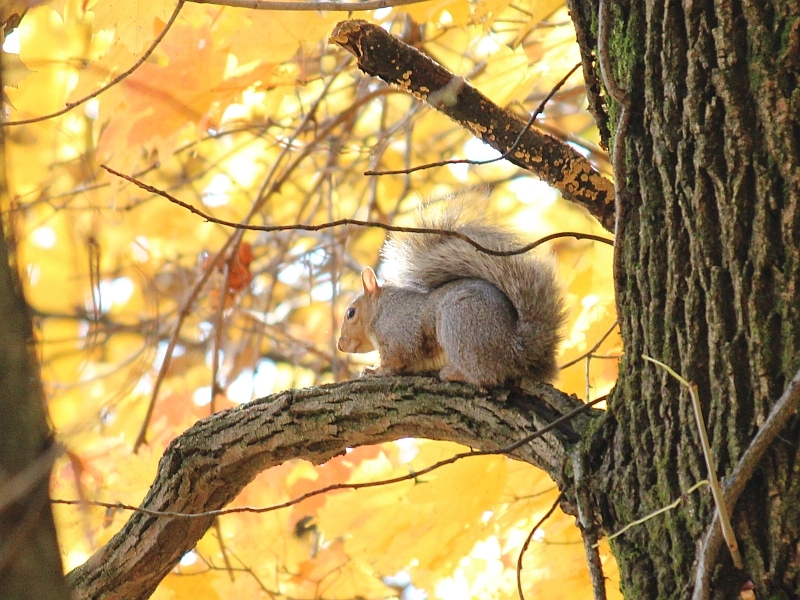 The Peanut Gallery – 2013 Review. 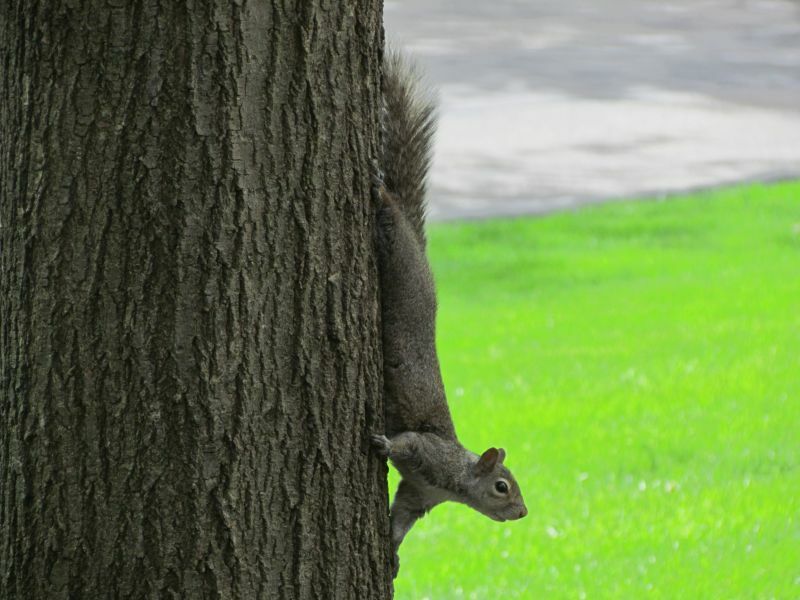 The Peanut Gallery – 2011 Review. 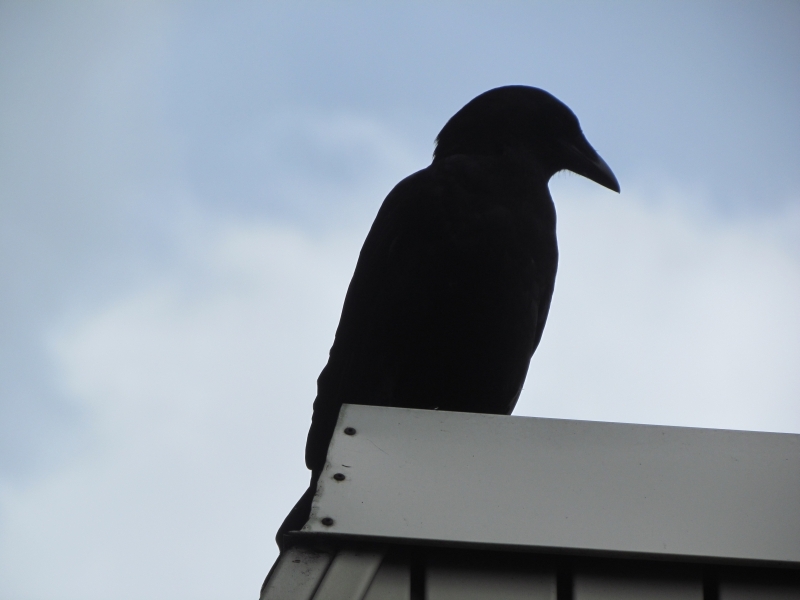 The Peanut Gallery – 2012 Review. 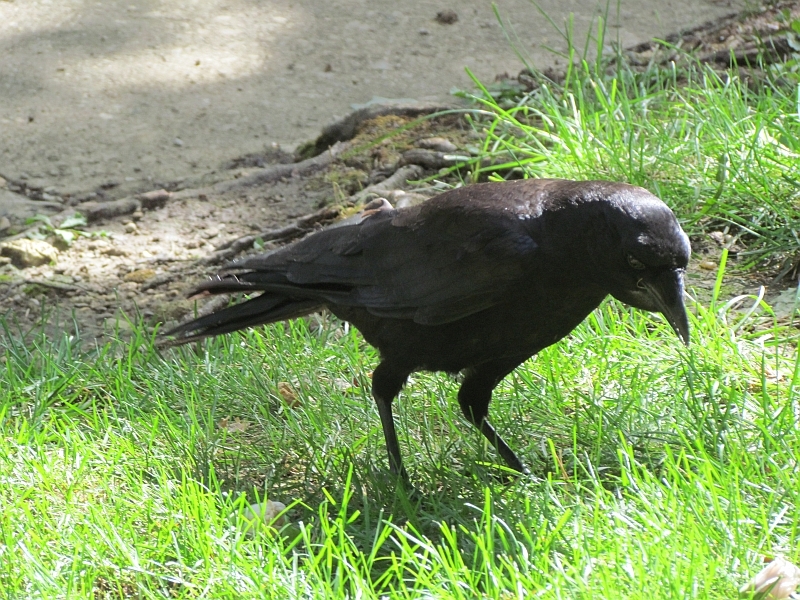 This all started with me putting out the occasional peanuts for birds and critters. 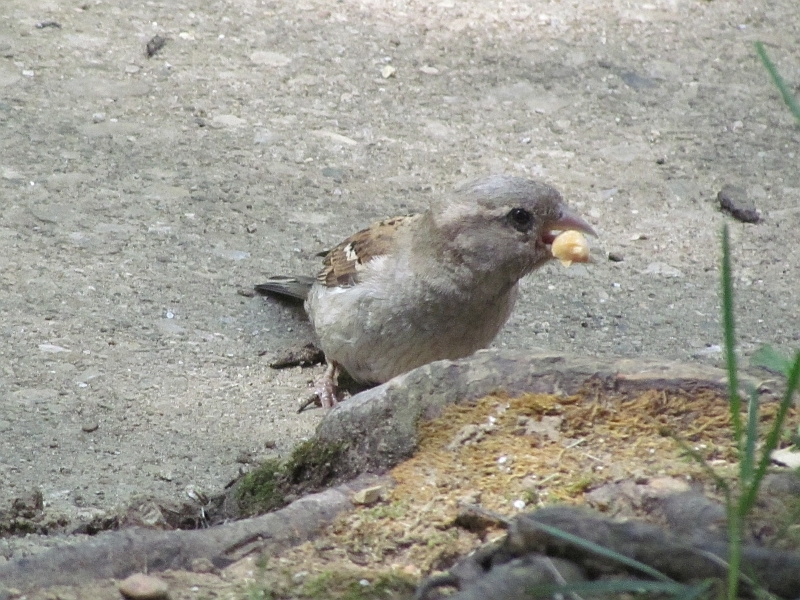 It has now expanded to a small feeder in the bush next to the front door, first filled with black oil sunflower seed and subsequently filled with safflower seed. 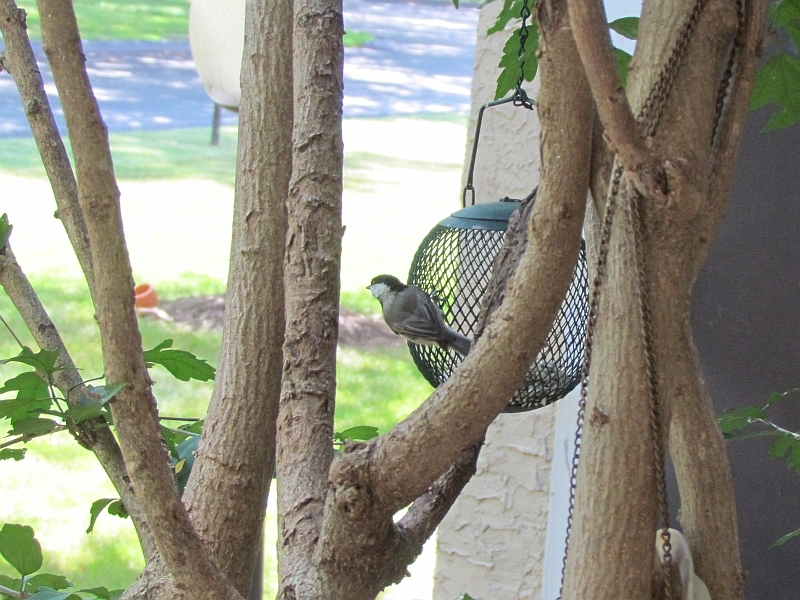 The sunflower seed husks seemed to kill the grass beneath the feeder, so I switched to safflower, which is generally shunned by most squirrels, starlings and sparrows but much loved by finches, chickadees, woodpeckers and mourning doves. This works well! Without further ado, here’s what’s been going on this past year mere feet away from where I am typing this. Robins pay special attention to my little area in February, when the berries they have subsisted on all winter are pretty much gone. 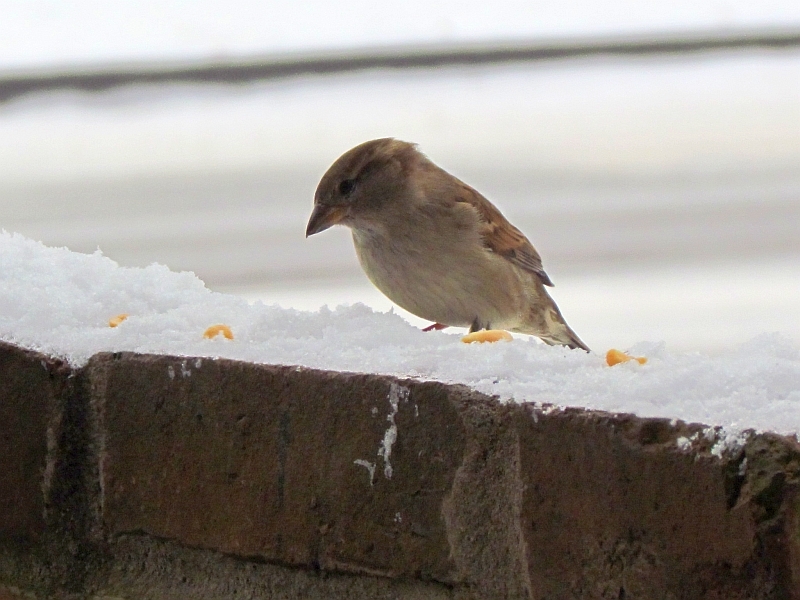 I put out raisins for them, which they eat. 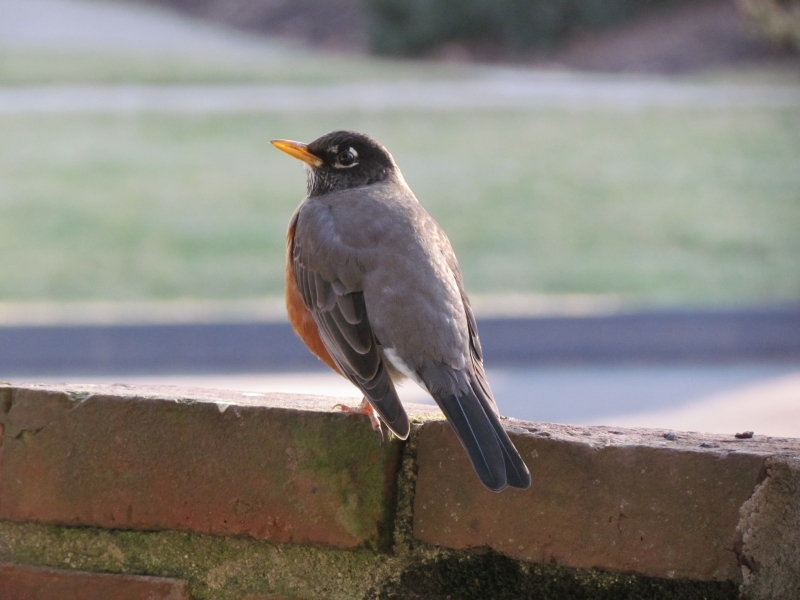 For more details, see my post Robins in February. One Robin inevitably seems to adopt my ‘front yard’ as its territory, getting an early start on attracting a female for spring nesting in the area. More details at A Robin’s Nest in Spring. 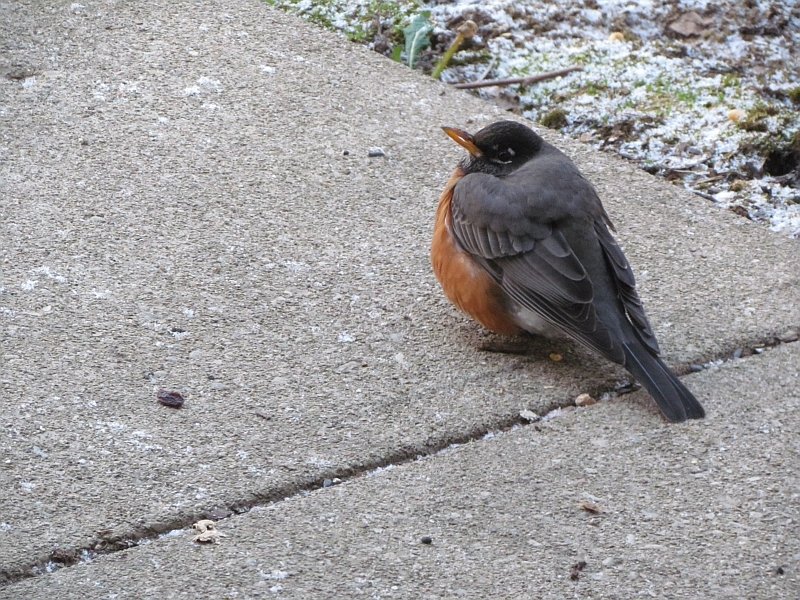 Otherwise, I just see the occasional Robin in the area looking for worms or bugs. 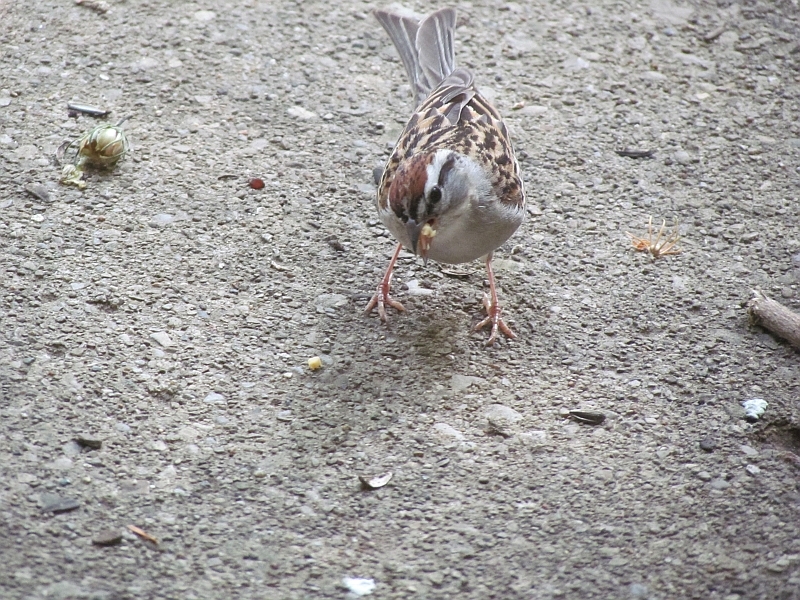 This year was an off year for Chipping Sparrows on my patio area. 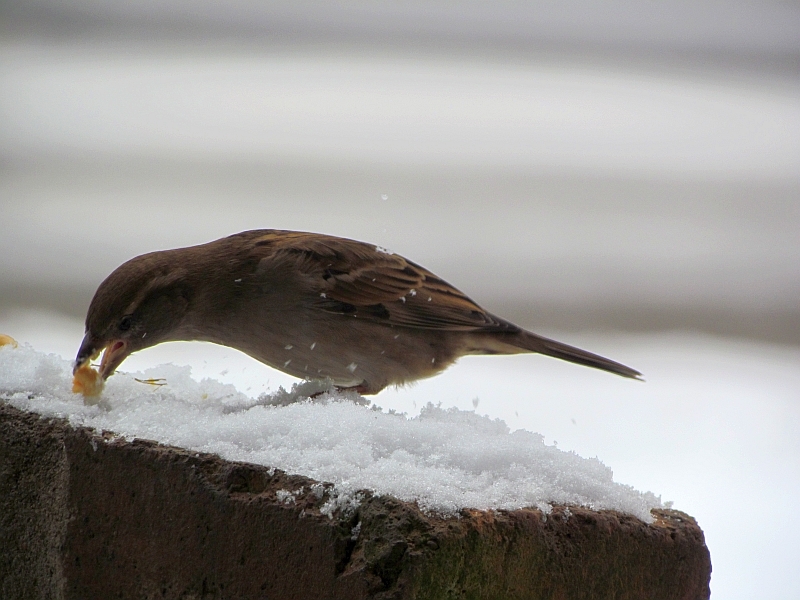 Last year was great- they visited often and brought by young birds for peanuts- but this year there was little of that. 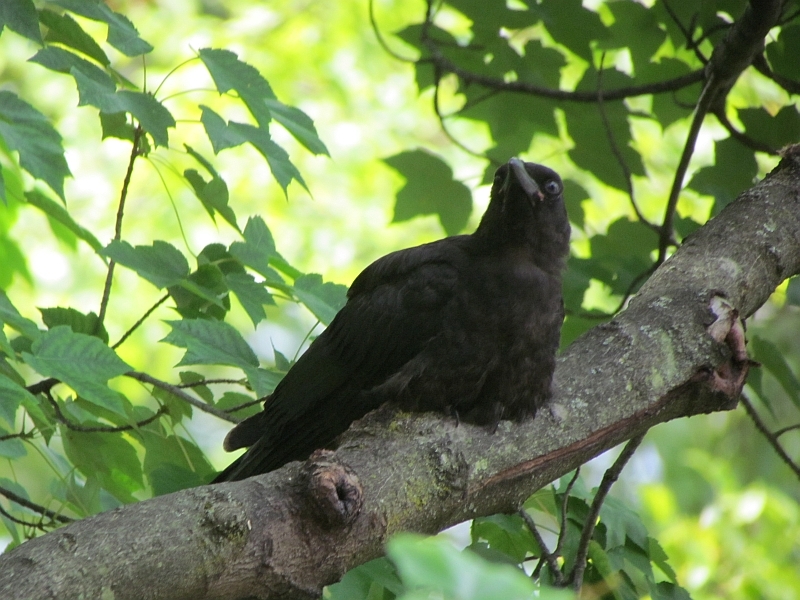 Maybe next year, I really like these gentle birds who often drop right out of the tree out front and plop right down on the sidewalk not very far away from me. 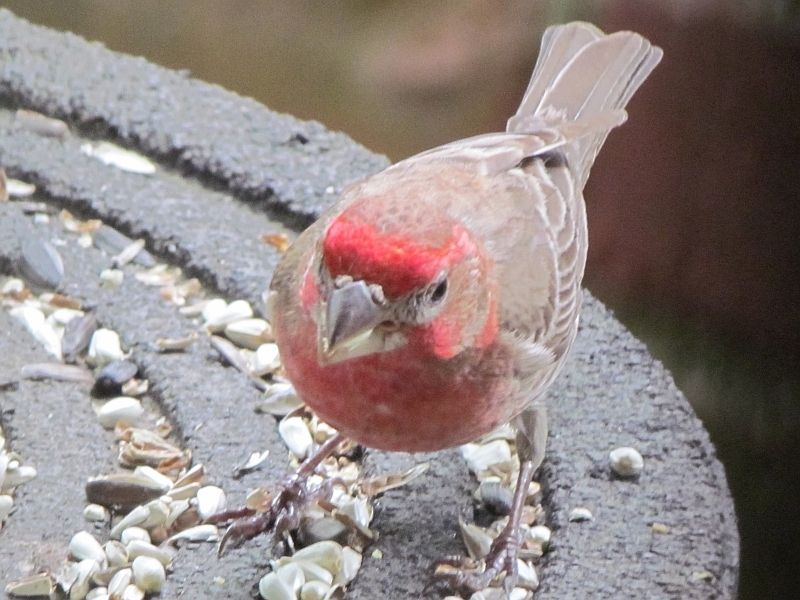 This year continued my spring-to-autumn Cardinal season. 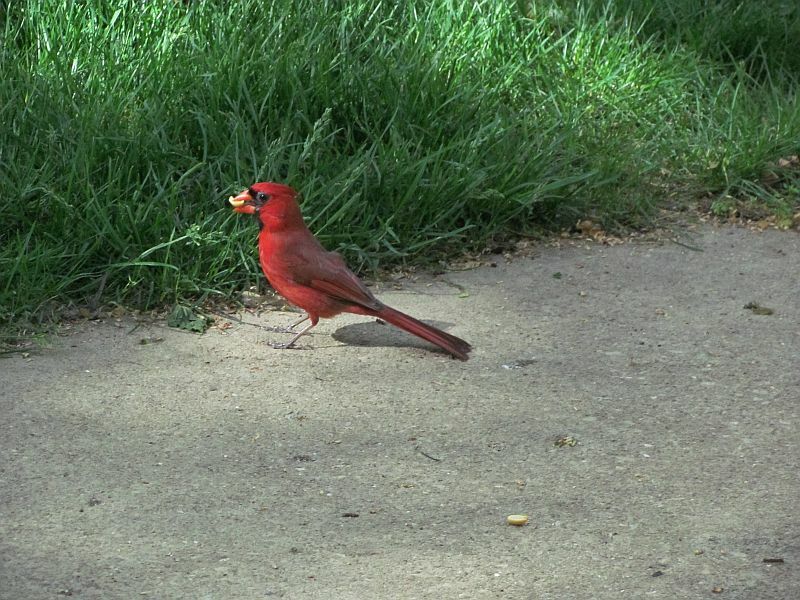 A pair of Cardinals- probably the same one or ones from previous years- come regularly for peanuts when they are raising their young ones. They are very protective of their offspring which I rarely see. 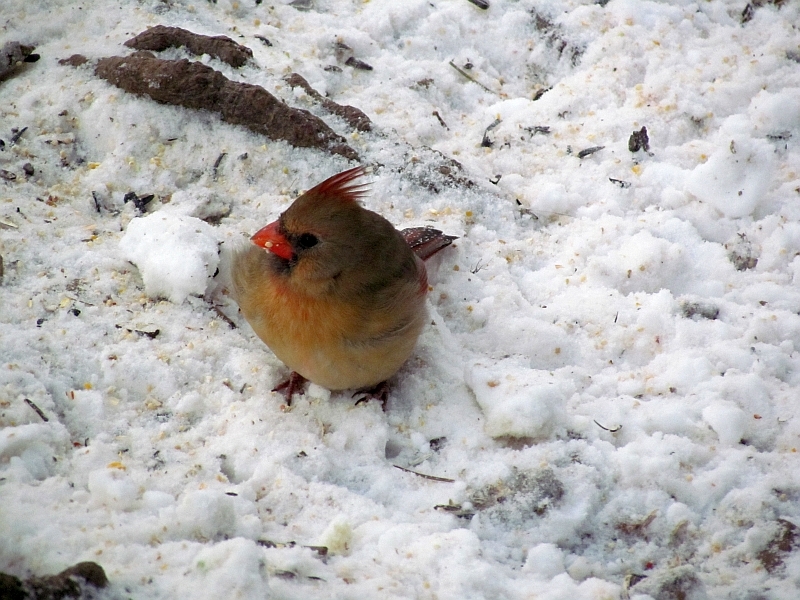 In the winter they join a flock of other Cardinals and I rarely see them until next spring, when it’s time to nest again. They are like old friends now. 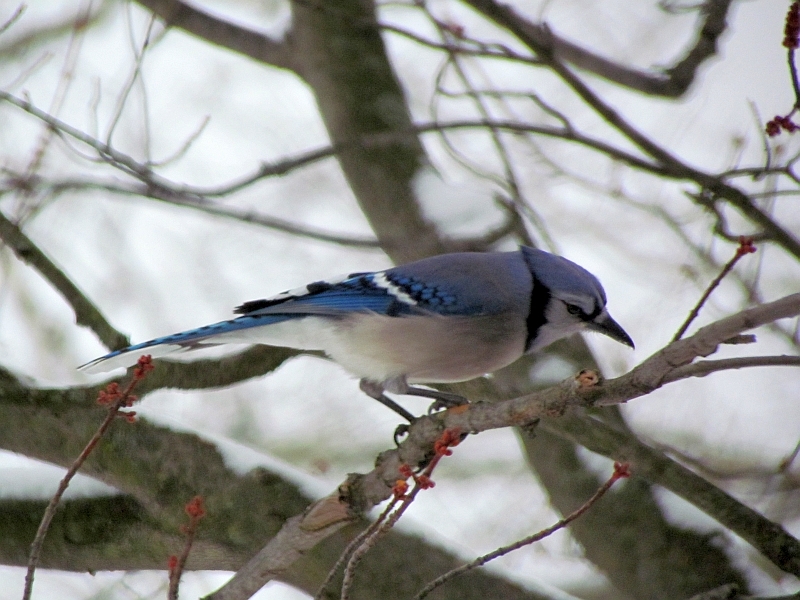 Blue Jays are occasional visitors in the autumn and winter. 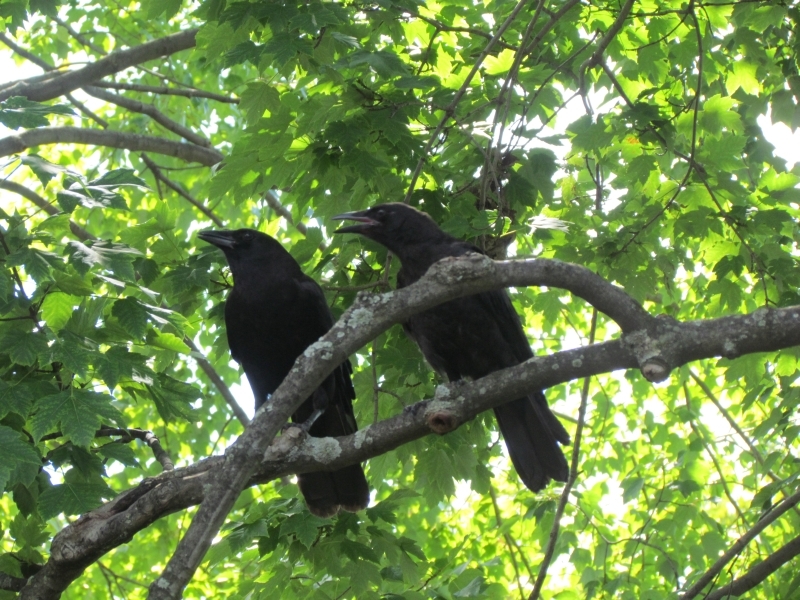 There are 1, sometimes 2 pair of them that squawk loudly until I throw them some peanuts (see the above picture). 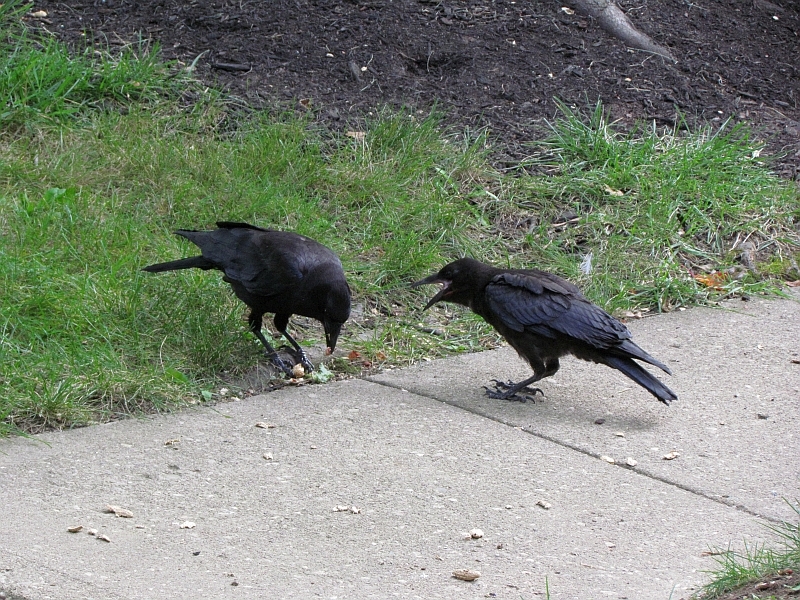 They like to sit in the bush next to the front door and dive down to the ground as soon as the peanuts hit the sidewalk. Noisy devils! 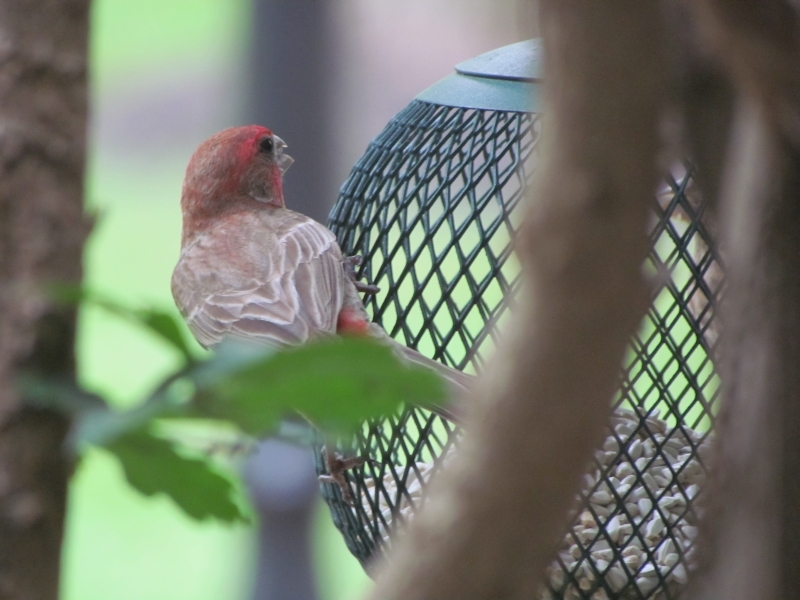 House Finches are regular visitors, especially since I started putting out safflower seed, which they love. 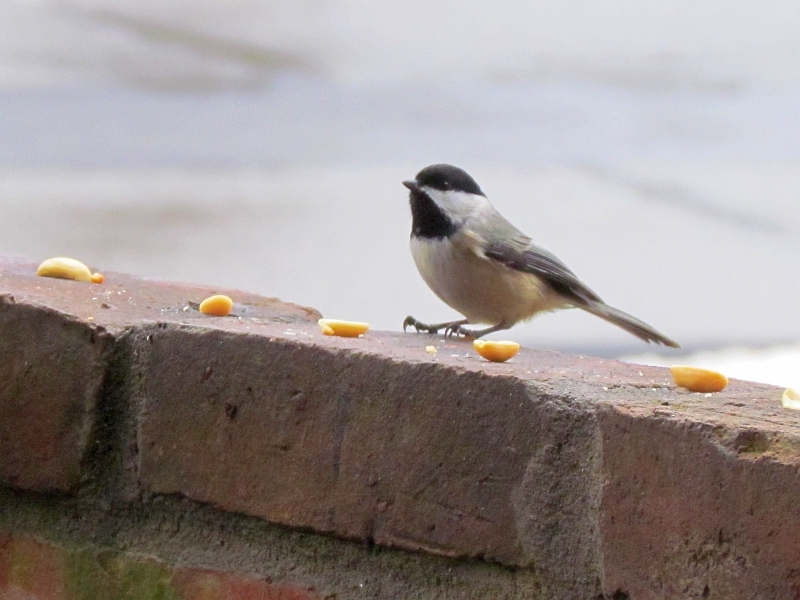 There are a pair of them who come daily to the feeder; occasionally I see up to 4. I enjoy these birds, the male’s raspberry color splash and their calls which are upward-lilting, sounding like they’re asking a question. 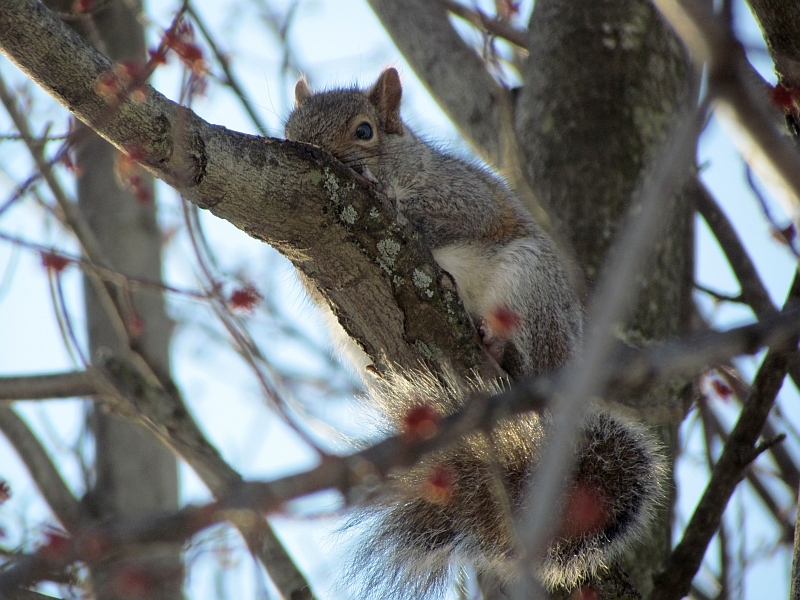 This neighborhood regular was seen a couple of times surveilling my patio looking for birds or squirrels to eat. I’m sure he’s responsible for the odd pile of feathers in the area. 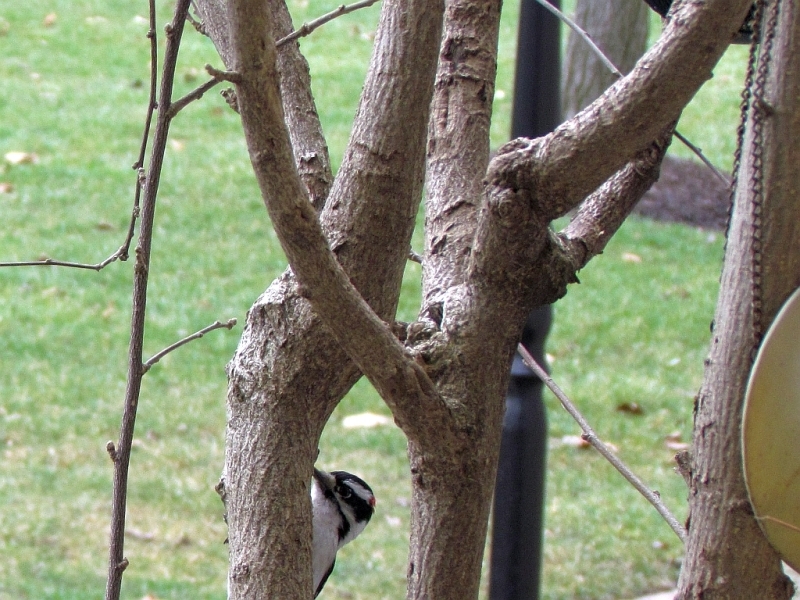 I hear this little woodpecker in the area occasionally, but rarely see him eating at the feeder. 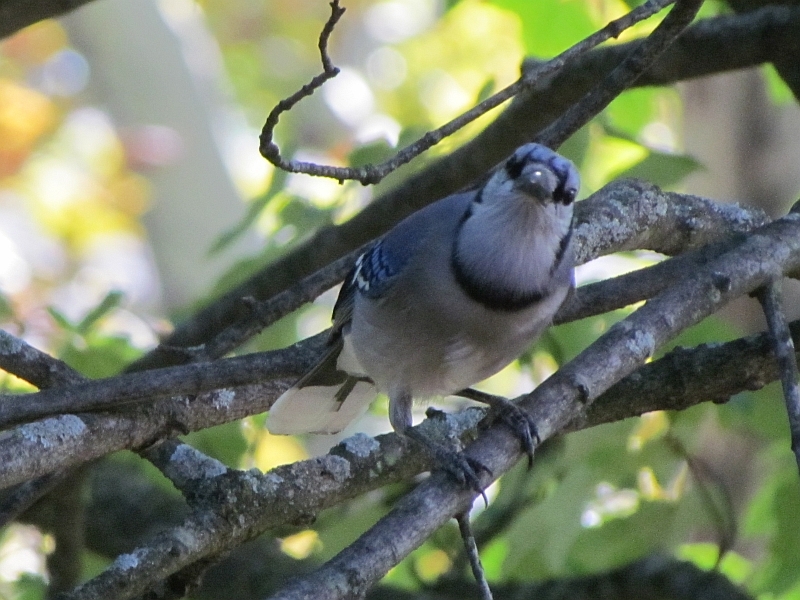 He’s pretty sneaky- here he is on the bush working his way up to the feeder. 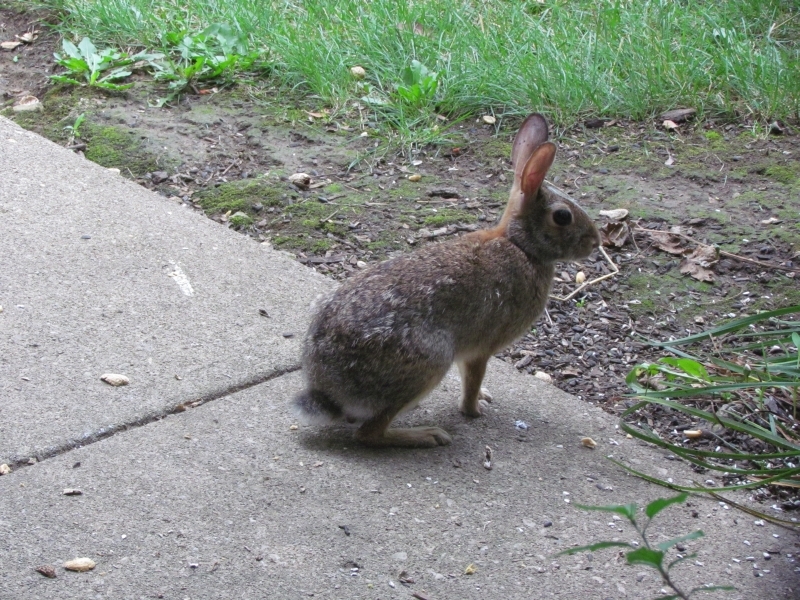 I’m pretty sure this Rabbit is the one I saw last year on my patio when it was very young. 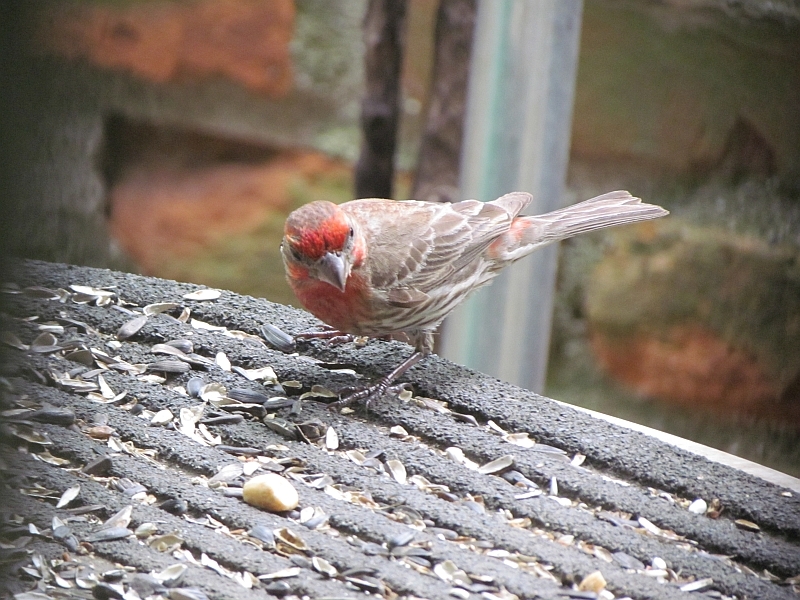 It’s older now, but I think it comes around for 2 reasons- to get a drink from the small and low iron birdbath I have, and to munch on safflower sprouts underneath the safflower feeder. 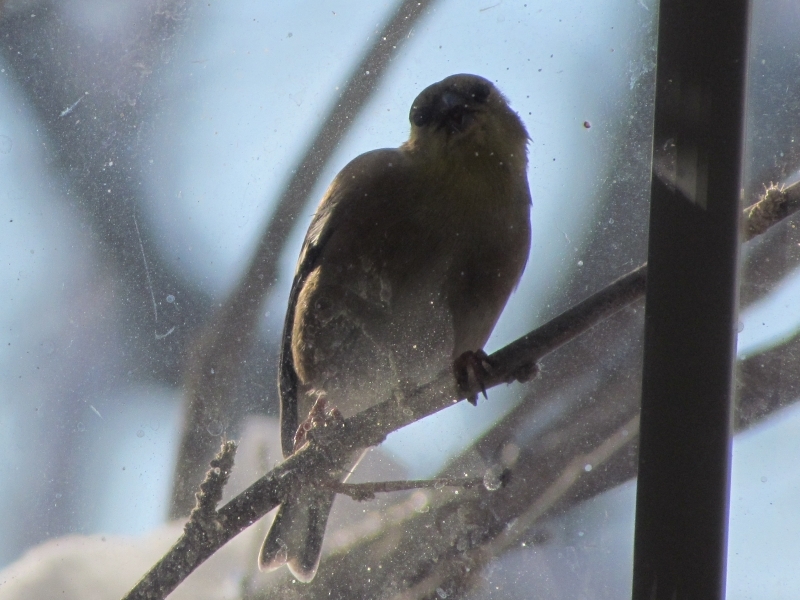 I saw this Goldfinch one day looking in the window while sitting in the bush near the feeder. 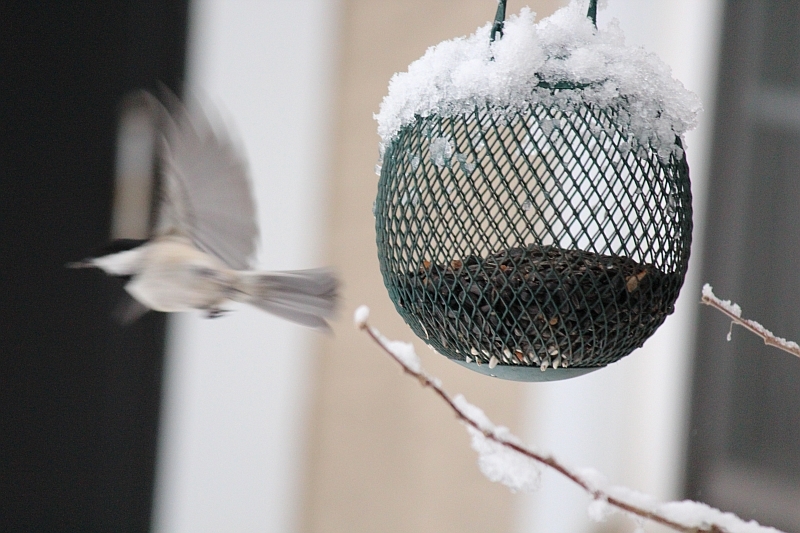 This surprised me because I don’t often see Goldfinches at the feeder. 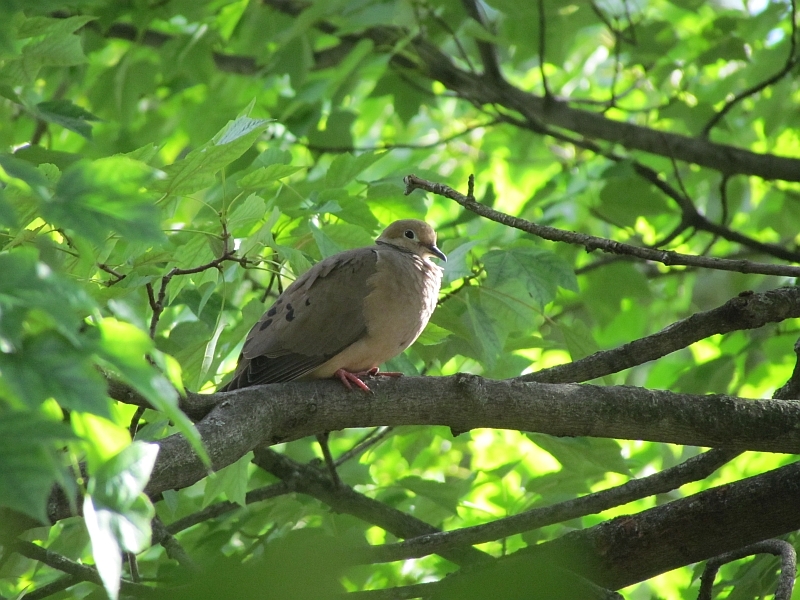 This was a big year for attracting Mourning Doves. 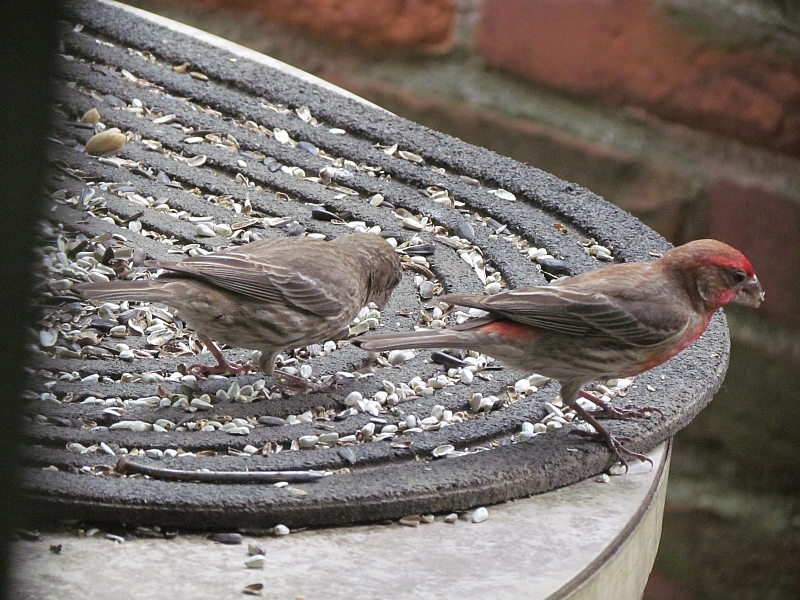 They absolutely love safflower seed that falls out of the feeder when the finches and chickadees eat there. I see from 1 to 4 of them on the ground under the feeder pecking around, though occasionally there’s a regular flock in the trees out front- one day I counted 13! They’re easy to ‘spot’- you can hear their wings whistle when they land or take off. 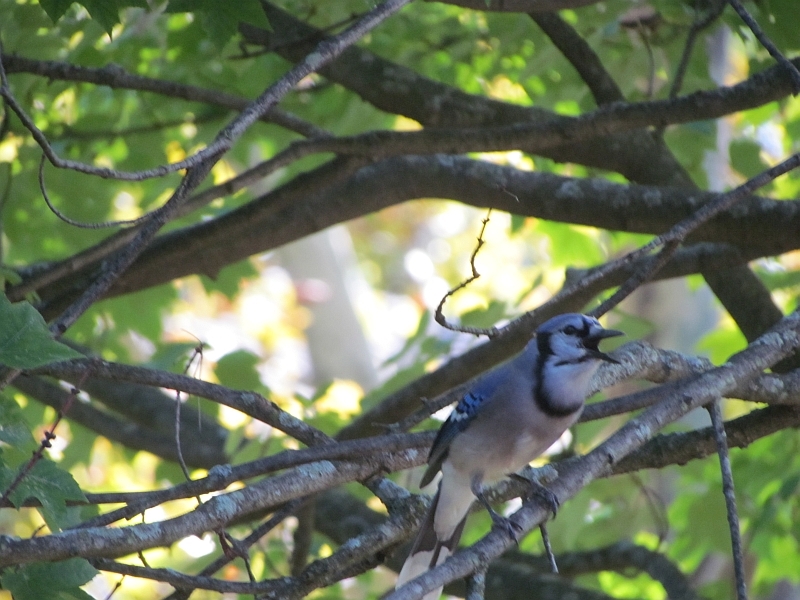 A pair of these birds are delightful regular visitors for peanuts and safflower seeds. 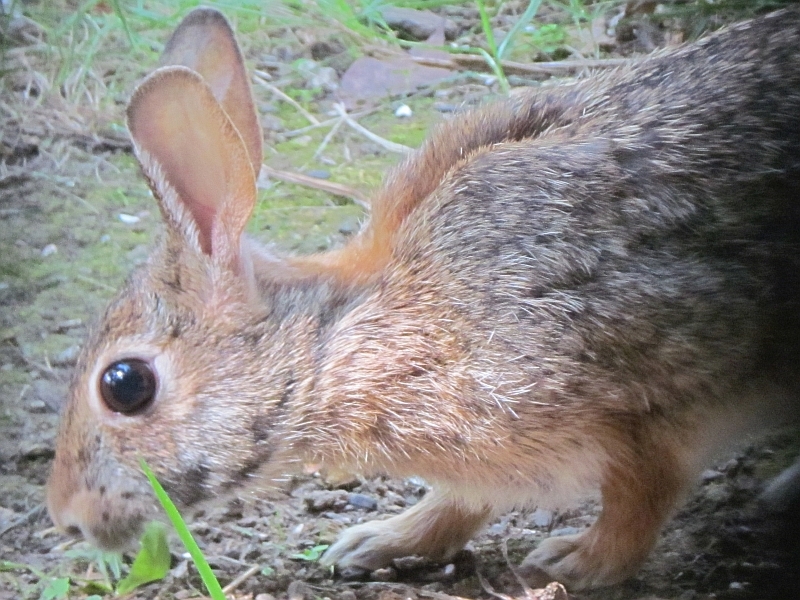 Their ‘dee-dee’ calls announce their presence, and they’re pretty tame. 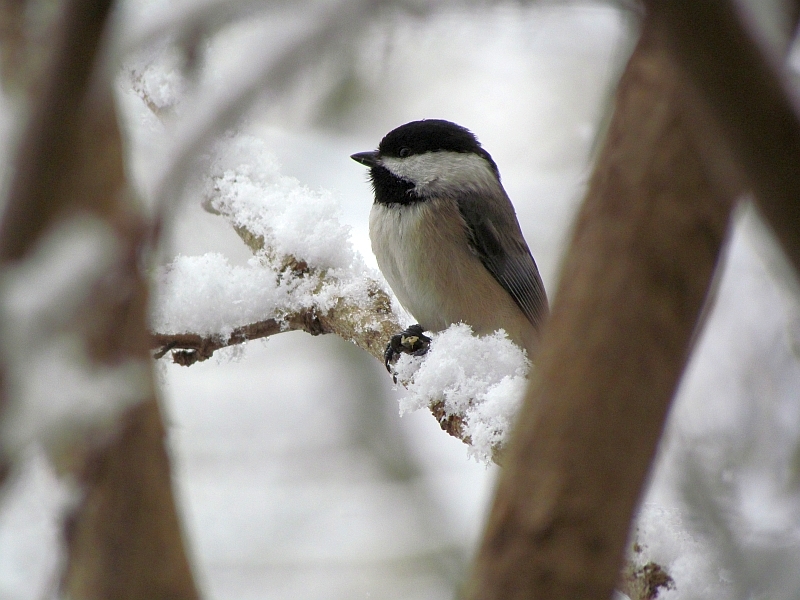 I see them year round, though less in the summer until they bring along a young one or two who beg for food after leaving the nest. 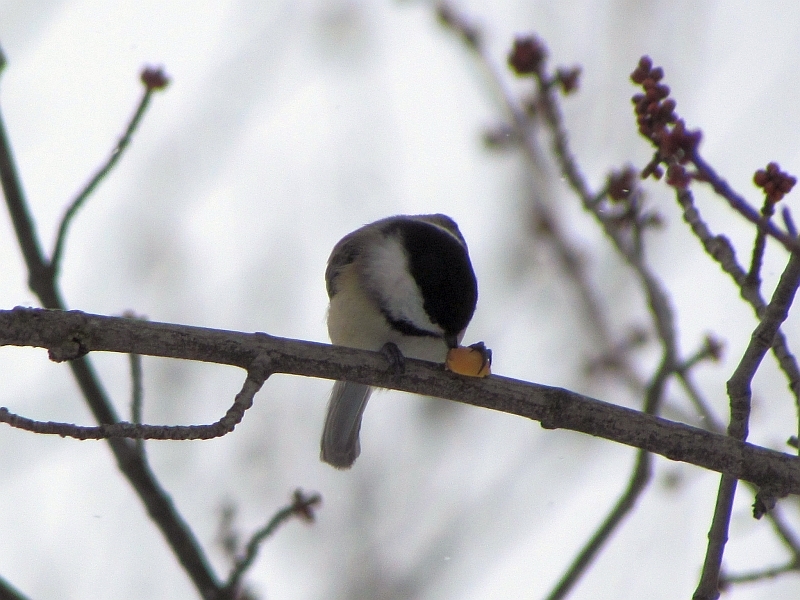 They often flit from the tree to the wall or feeder for a seed or peanut and then flit back to a perch to eat it. 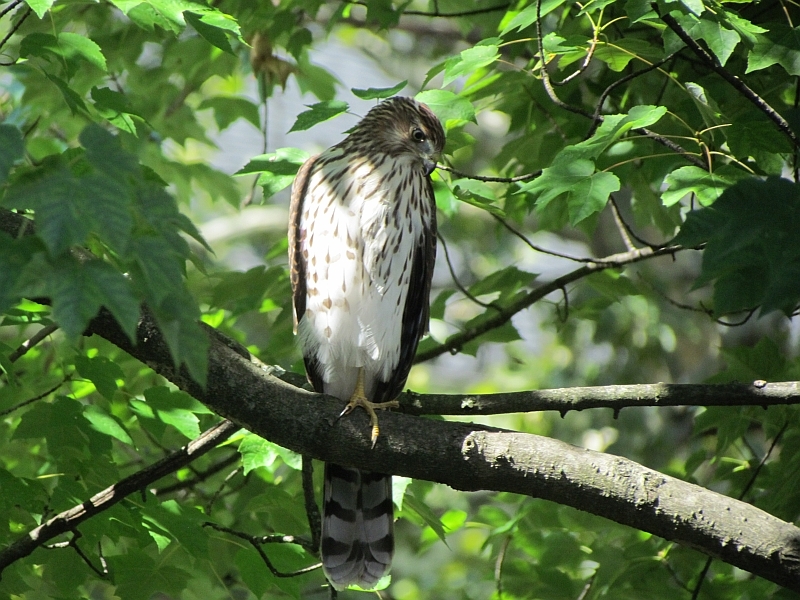 One of my favorite birds, they are fun to watch. 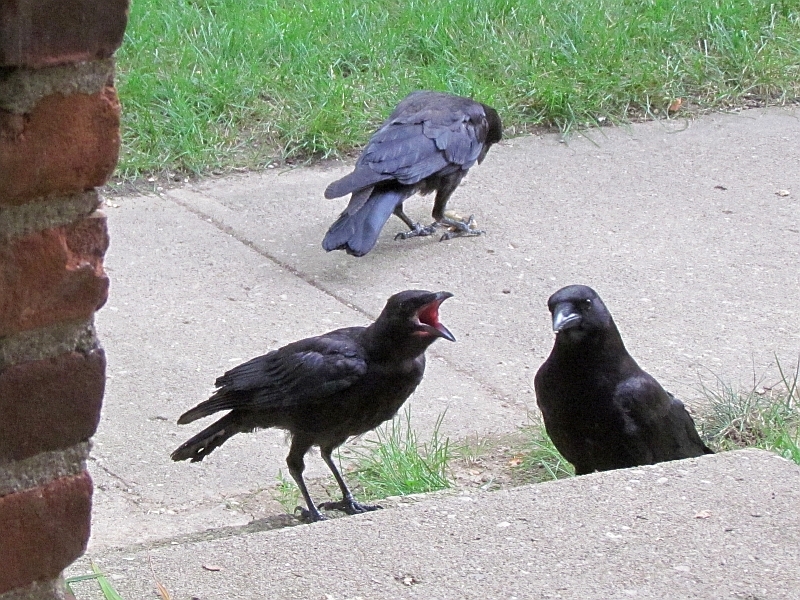 There’s a family of 6 Crows that are regular visitors, usually announcing their presence with cawing. Sometimes I’ll only see 2, other times 4, occasionally 6. 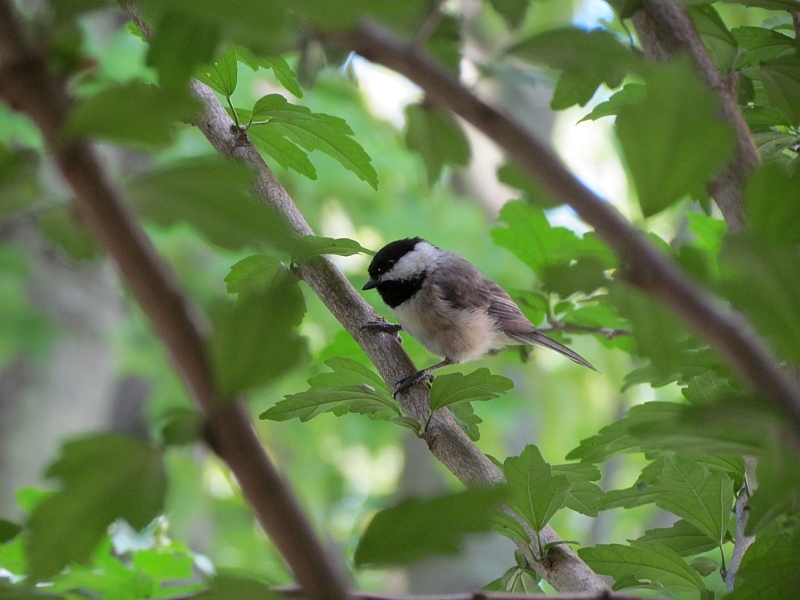 There is the male and female parent birds, one of them I call ‘Flinchy’ because he or she grabs a peanut while jerking backwards as if something is going to jump them when they eat (I’m sure there’s a wild story behind that habit). One of their offspring mimics this habit! Another 2 birds are older siblings who hatched a year or two ago but stay in the family for a while before starting their own. 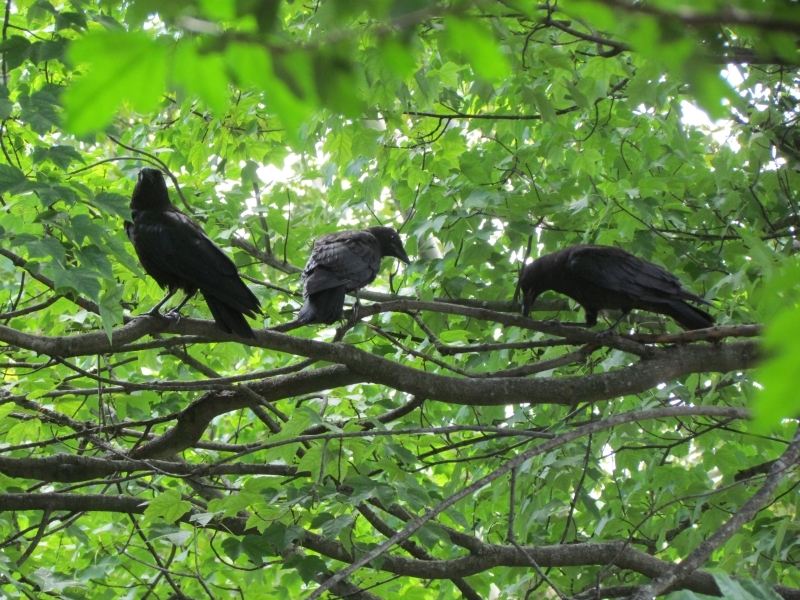 The last 2 are young Crows who were born this year and are learning the ropes about how to be a full fledged member of the Crow clan. This year brought 2 more young ones to look for peanuts with the family. 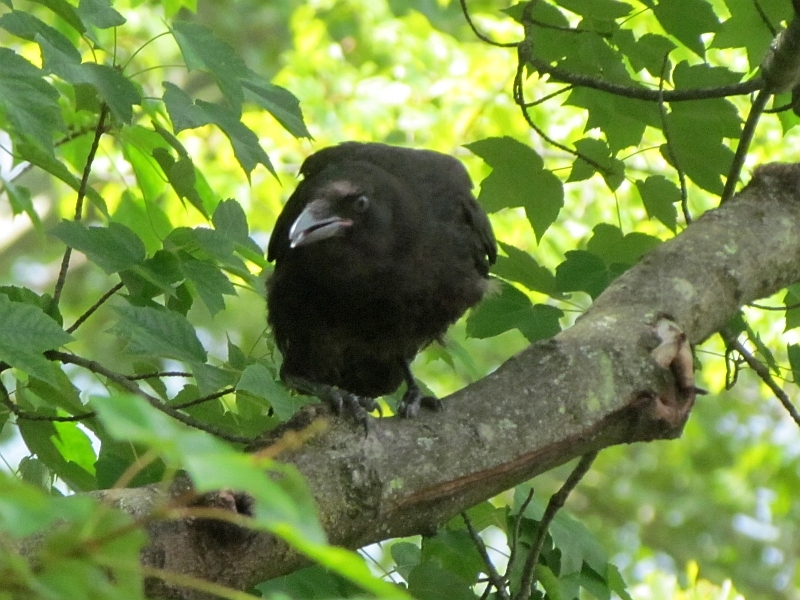 You can tell the young Crows by their red mouths (and incessant croaking and begging). 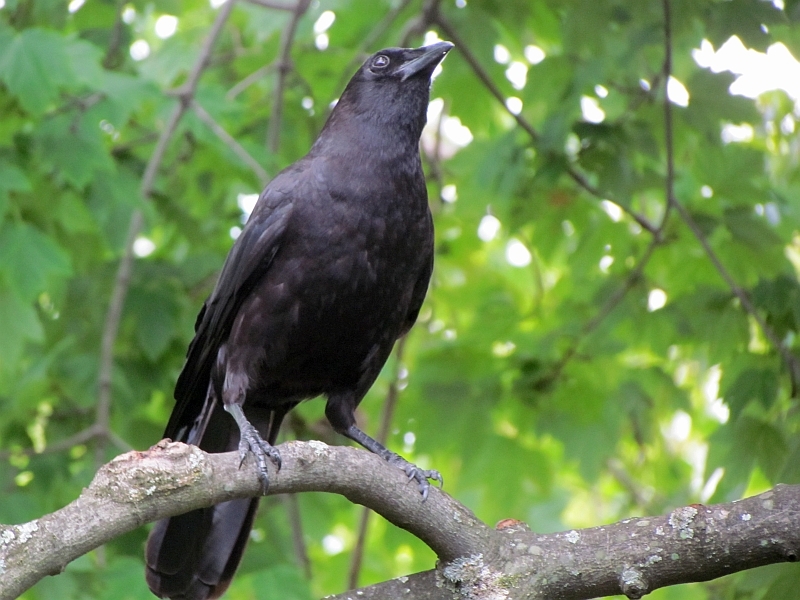 I’m a big Crow fan partly because they are so intelligent- they’ve recognized me while I’m taking neighborhood walks by swooping by me and waiting for me to toss them a peanut (which I always carry). They will sometimes follow me to my car in the parking lot and hang out on the ground waiting for a peanut tossed from the window. Smart birds! 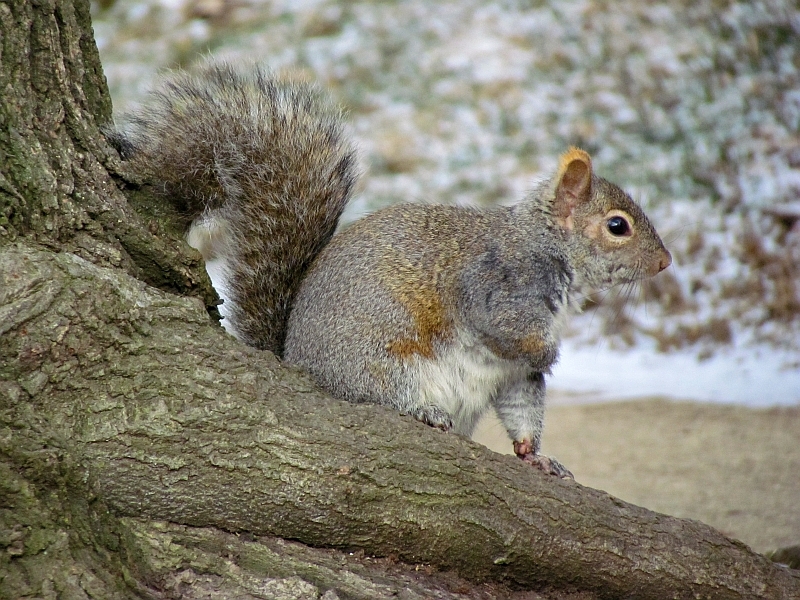 Last but not least – Gray Squirrels! 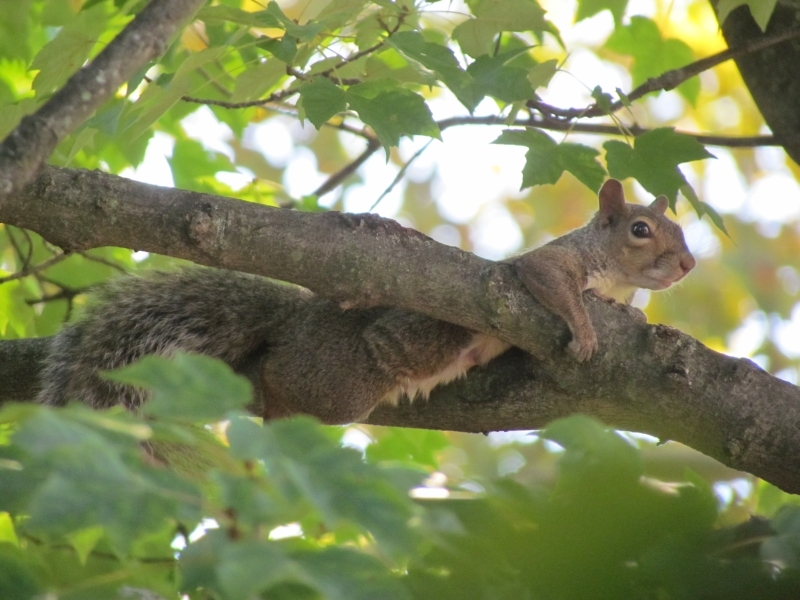 There are up to 6 Gray Squirrels in the general neighborhood, some of which have been coming around for a couple years, others who were offspring from the older regulars. If you spend time watching them, you can tell the subtle differences in their personalities and mannerisms. Some can carry 2 peanuts at a time, others only 1. 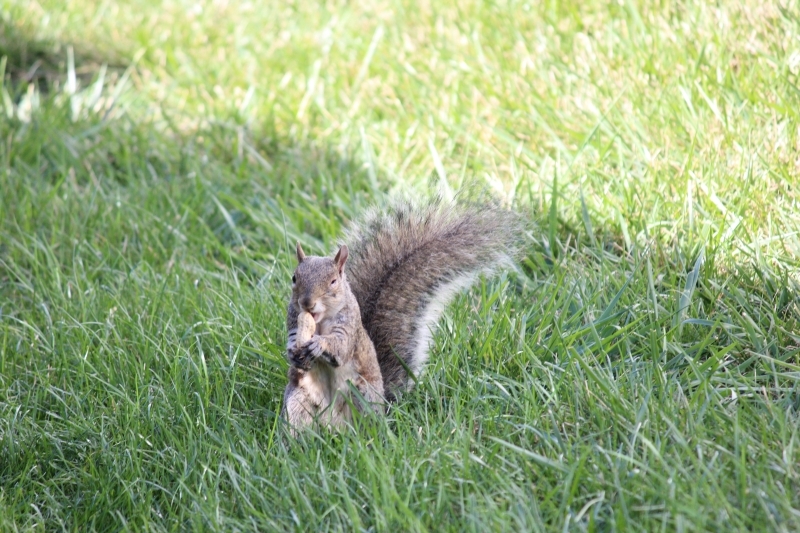 Some can unerringly find a peanut tossed in the grass, others can miss a peanut that sailed by their head that landed a foot away. 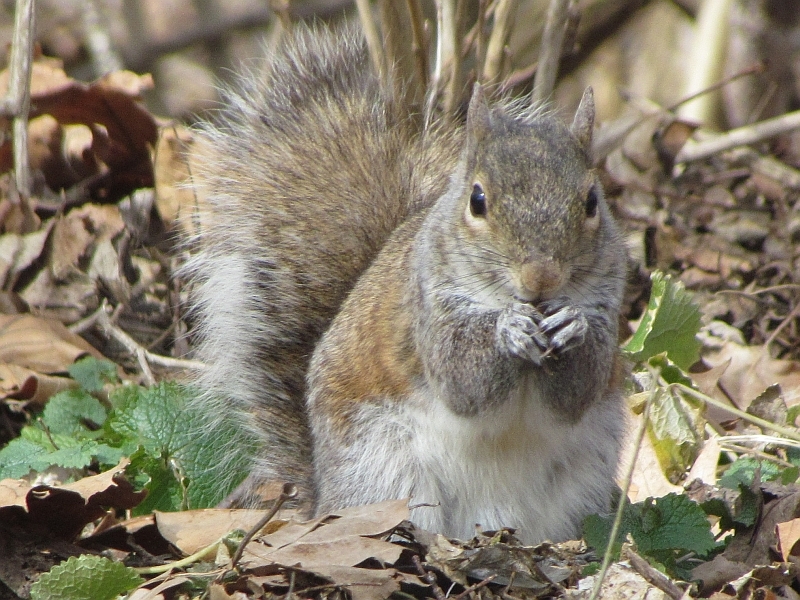 Some are friendly, others shy, some are standoffish, but all love peanuts. 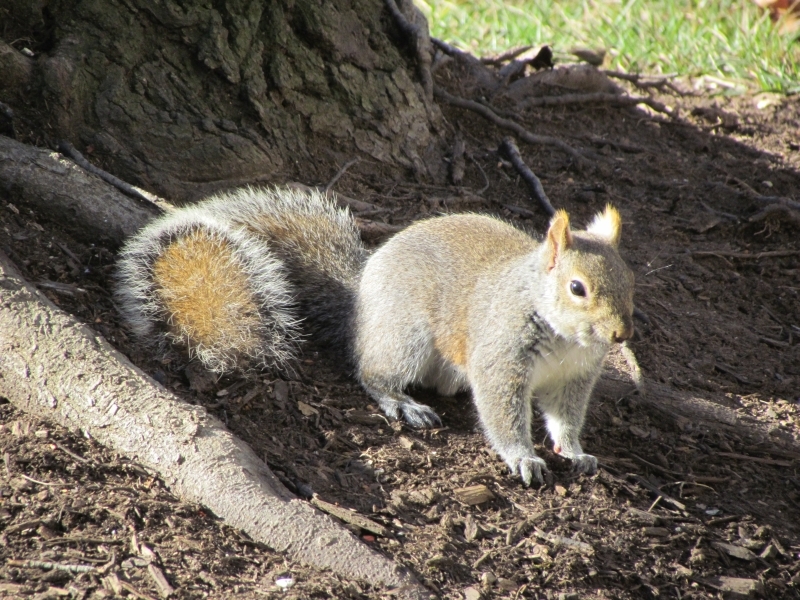 Check out that last photo of a squirrel- that’s one that I call Squinty. One eye is normal, the other is either missing or squeezed mostly shut. 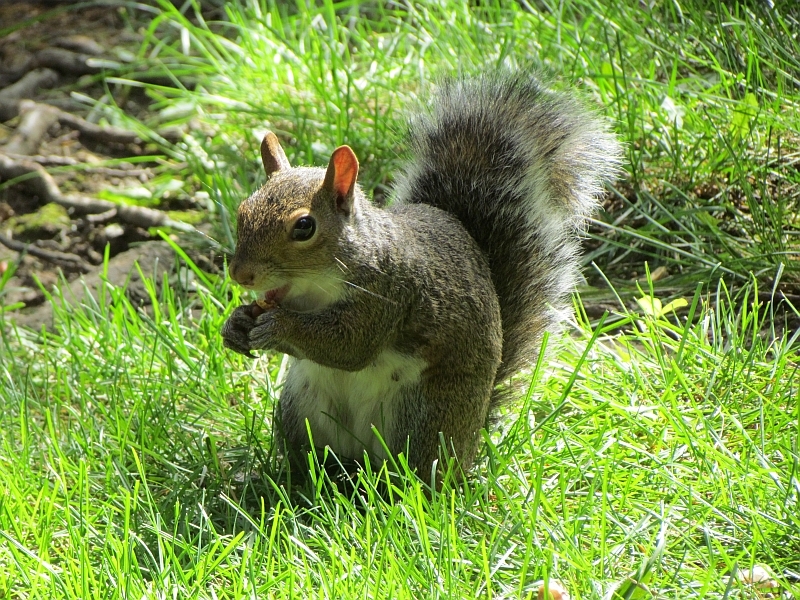 It may have been injured, but this squirrel gets along fine and is actually pretty friendly. Animals can recover from serious injuries, partly because their high metabolism speeds up healing and their higher body temperatures can kill germs rather efficiently. They may not live as long as we do, but they are tenacious! Thanks for sticking around another year and reading this blog- I appreciate each and every one of you, and always enjoy the comments. At one time I thought I’d run out of things to post, but that’s going to take a while 😉 Posting is fun. May 2014 be a great year for all of us- Happy New Year! ← Nature in Winter – Tracks in the Snow. Black oil sunflower seed husks and dead grass. Is that why some “expert” I read recommends striped sunflower seeds? Thank you your posts. I always learn something. Looking forward for more in 2014. Happy New Year. I’ve seen the grass-killing properties mentioned online, wish I would have known about that beforehand…hulled sunflower seeds would be a great compromise, I’d think. Many thanks and happy 2014, Keekeepod! What a wonderful variety, and you seem to have befriended quite a few of them! 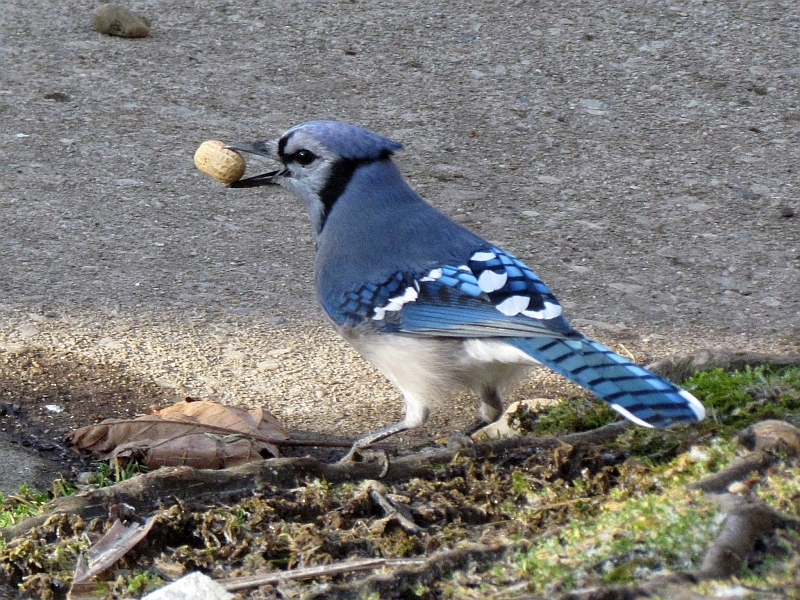 I love the cardinals and the jays – their colours are gorgeous. Lovely to keep a record like this – it’s something I should do, too, in our own garden. A very Happy New Year to you! Many thanks and Happy New Year Jo! What fun! 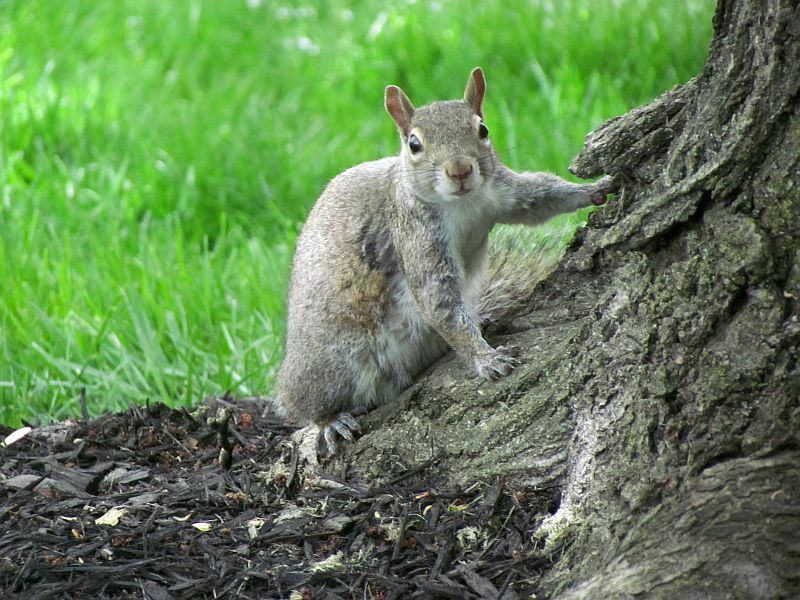 We may have to try a peanut feeder. Enjoyed your pictures! It’s a fine year that you’ve had! 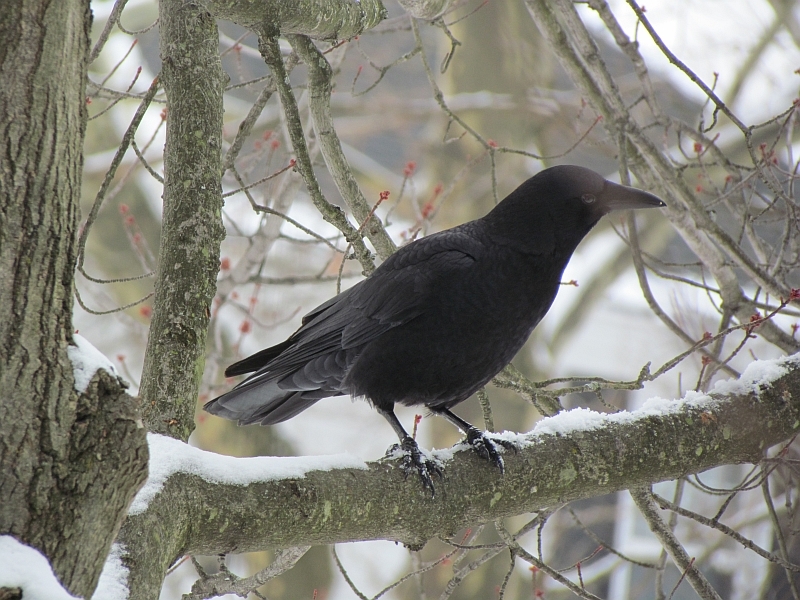 I hope the new year brings you another rich crops of visitors. Many thanks, Tootlepedal! 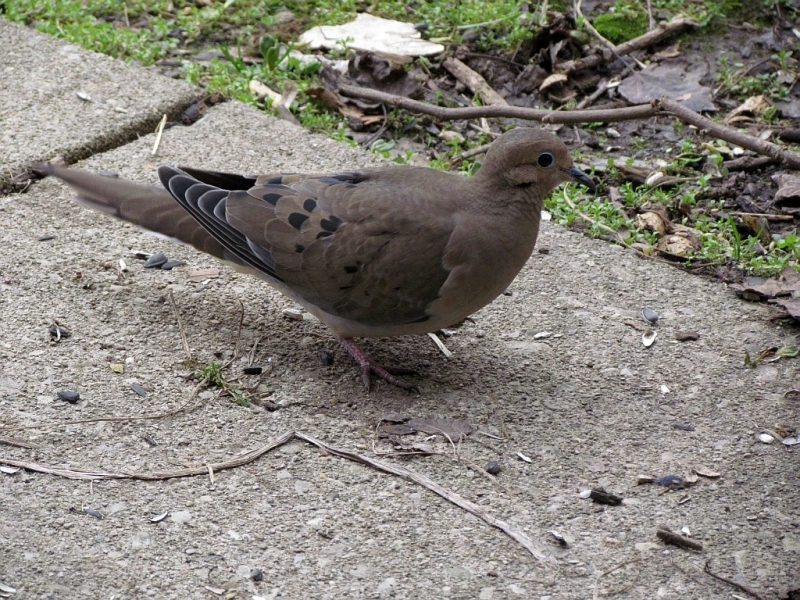 I may try sunflower hearts sometime, but I may face a near-riot by the Mourning Doves who can’t get enough of the safflower seeds. 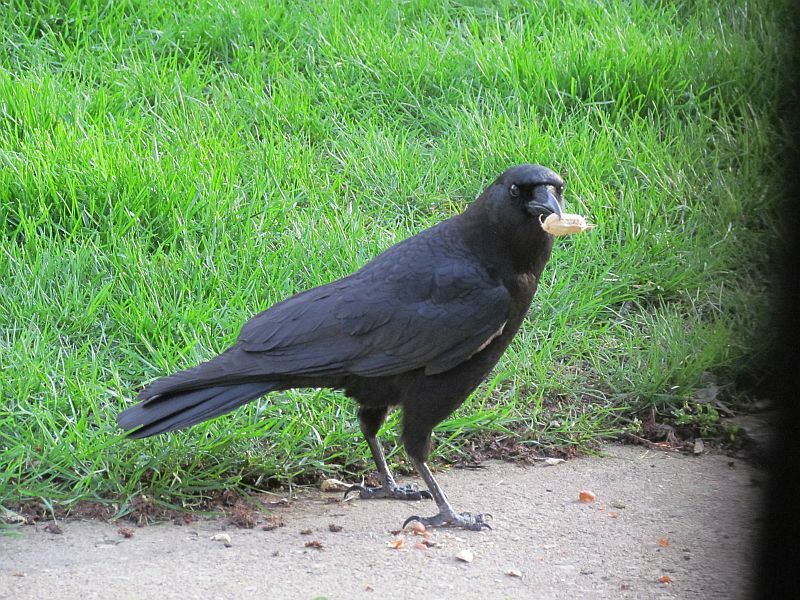 Have you ever fed the crows dog food? The LOVE it! Thanks for another great post. I laughed at some of your shots of the blue jays. By now you must have younger generations coming after being taught by their parents that your place has the best food. Happy New Year! Thanks and Happy New Year, Gardener!